Keeps your finish Show Prepped! Boyd Coddington Show Prep Exterior Detailer combines the super-slick and glossy qualities of a spray wax with the efficient cleaning abilities of a waterless wash to give you an instant quick detailer. One application leaves behind a depth of clarity and a strong layer of protection, reminiscent of a spray sealant, for a freshly detailed finish every time. Whether you drive a hot rod or an everyday driver, Boyd Coddington Show Prep Exterior Detailer keeps your finish looking fresh. Whether you're in between washes, or just trying to increase your shine, Boyd Coddington Show Prep Exterior Detailer rejuvenates your finish! 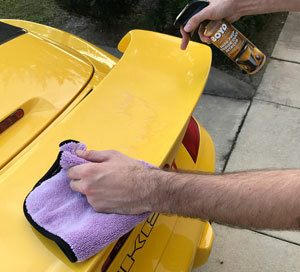 Of all the detailing products available, one of the most important staples is a quality instant detailer – perfect for those moments when you notice a smudge, some dust or dirt, or simply want to enhance your finish a little more after a detail. Providing long-lasting shine and advanced UV protection, Boyd Coddington Show Prep Exterior Detailer has proven itself in the car care industry. The rapid bond technology of Boyd Coddington Show Prep Exterior Detailer results in instant shine. Transparent polymers enhance metallic paintwork and add depth to darker colors. Safe for use on metal, paint, glass, chrome, plastic, Plexiglass, and fiberglass, Boyd Coddington Show Prep Exterior Detailer can be widely regarded as the ultimate quick detailer. Quickly remove dust, dirt, fingerprints, water spots and more with Boyd Coddington Show Prep Exterior Detailer – you never know when you’ll need your vehicle to shine at its best!